For those of us who are plagued with the kind of pesky dandruff that makes any black outfit a potentially humiliating experience, the hunt for a good dandruff shampoo is all-important. 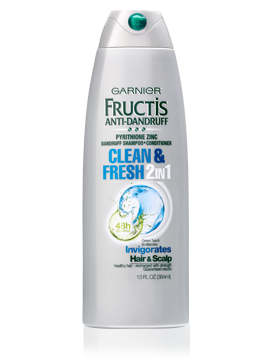 Garnier Fructis 2-In-1 Clean & Fresh Shampoo + Conditioner, fortunately, is the affordable and flake-free solution we’ve been searching for. Wear that little black dress worry-free with this shampoo + conditioner combination! I’ve been using Garnier Fructis Anti-Dandruff Shampoo + Conditioner for the last two years, and after a string of bad shampoo decisions, it has been a blessing for my poor scalp. While many dandruff shampoos claim to “fight dandruff at its source for a deep, flake-free clean that lasts for 48 hours”, this dual-action concoction consistently leaves my hair flake-free in between washes. The 2-In-1 action saves time in the shower by eliminating the need for an additional conditioner, and I save money by not having to buy another bottle of conditioner to go with my shampoo. However, people with extra-coarse hair may not benefit much from this feature, and might find another conditioner necessary to tame any extra tangles. The Garnier Fructis formula is based in green tea and natural B-vitamins, which leaves my hair healthy, shiny, and strong. I also find that unlike most dandruff shampoos, this shampoo has a very pleasant smell that stays in my hair between washes. This anti-dandruff shampoo can be purchased from the Garnier Fructis website for $11.99, and ranges anywhere between $7.99 and $15.00 in various retail stores such as Target and Wal-Mart. While this shampoo is definitely a great option for anyone fighting dandruff, strong medicated shampoos are not for everyone. If you have a sensitive scalp, you might have better luck trying Garnier Fructis’ Daily Care Shampoo instead. For less severe cases of dandruff, Head & Shoulders 2-In-1 Sensitive Scalp Care and Selsun Blue 2-In-1 Formula are also good options. My search for the perfect dandruff-fighting shampoo is over, and at such an affordable price with such great results, yours can be, too.